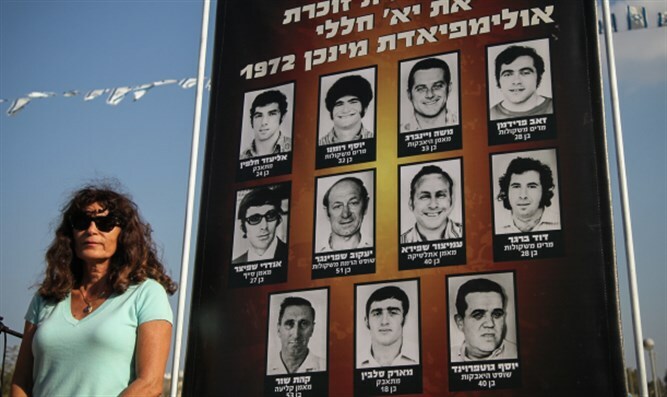 Forty-five years after the PLO carried out a terror attack on Olympic athletes, a memorial dedicated to the victims is to open in Munich on Sept. 6. In 1972, the Black September terror group carried out a terror attack during the Summer Olympics. Eleven Israeli athletes, coaches, judges, and delegates were murdered in the attack, together with a German police officer. At the memorial's heart stands the biographies of twelve victims killed in the attack, on panels with texts in German, Hebrew and English. “We wanted to give the victims their identity back in the eyes of the public,” Bavarian Minister of Culture Ludwig Spaenle told media on Monday, during a preview of the site, cut into a hillside in the former Olympic park. The memorial cost 2.35 million euros ($2.8 million). Funding came primarily from the State of Bavaria, the German federal government, the City of Munich and the International Olympic Committee. Up to now, the main memorials have been a sculpture and plaque. Plans for the new memorial were announced in 2013. Finally, the human stories are being told –- and the lessons of history underscored, said Jewish leaders ahead of Wednesday’s opening ceremonies. The new memorial attests “to the bloodshed that soaked what should have been a joyous celebration of sport” and camaraderie, Ronald S. Lauder, head of the World Jewish Congress, said in an e-mail to JTA on Tuesday. He also said that life for Jews has changed for the better in Europe over the past 80 years, despite a recent increase in anti-Semitism and anti-Zionism. “We should also be encouraged by the fact that so many European government are vigilant in their defense of Israel and of all of their citizens, Jews and non-Jews alike,” he added. She applauded an additional, as yet incomplete element of the memorial –- a “school of democracy” to be located in the tower at the Fürstenfeldbruck airport, site of the fatally botched rescue attempt. The memorial was designed by a team under the auspices of the Bavarian Ministry of Culture, in consultation with family members of victims, the consul general of Israel, experts from the concentration camp memorial at Flossenburg, the Jewish Museum in Munich and the Bavarian State Ministry for Political Education. Ahead of Wednesday’s ceremony, German news media featured interviews with family members, several of whom are expected to attend. Among them will be Ankie Spitzer, who was 26 years old when she lost her husband, the coach and fencing master Andre Spitzer, in the attack.